The Baylor Bears embrace and celebrate their National Championship. Photo courtesy of Baylor Athletics. 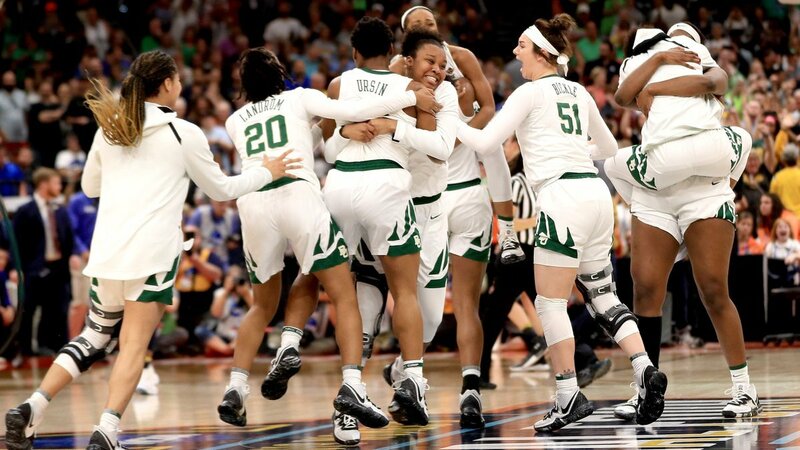 Tampa, Fla. – Baylor’s Chloe Jackson drove to the basket for a gutsy, contested layup with six seconds on the clock in the final quarter of the 2019 National Championship game. The ball rattled around the rim before finally dropping and giving the Lady Bears a critical two-point lead with just three seconds to go. 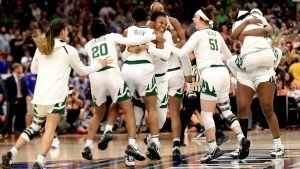 Against another team, the title could’ve been in the bag, but against a Notre Dame team with its buzzer-beating star Arike Ogunbowale, Baylor knew it had to play to the very last tenth of a second. So, when Ursin Moon sent Ogunbowale to the free throw line with just 0.01 remaining, the Bears’ tournament champion hopes were far from secure. Chloe Jackson scored a career-high 26 points and was named most outstanding player of the game. Photo courtesy of Baylor Athletics. 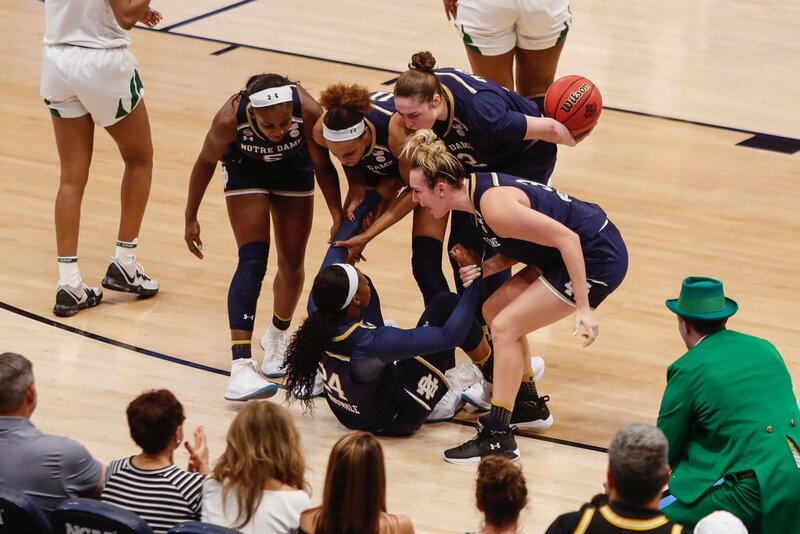 Ogunbowale missed the first shot; and at that point, even with her made second shot, Notre Dame fell just one-point short of its repeat hopes at 82-81, decided in the last tenth of a second in Amalie Arena in Tampa, Florida in front of 20,127 people. Chloe Jackson led the Lady Bears with 26 points, including the game winner. Kalani Brown scored 20 points and grabbed 13 rebounds, and freshman NaLyssa Smith came up big off the bench for 14 points. It was the third National Championship for coach Kim Mulkey, whose squad beat the Irish for the honor in 2012. The Irish said they came up short as a team. Kalani Brown goes up for two of her 20 points on the night. Photo courtesy of Baylor Athletics. 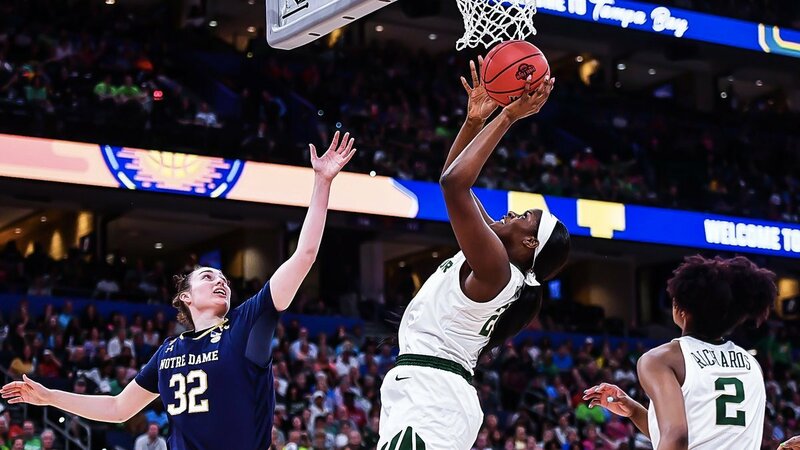 Ogunbowale scored a game-high 31 points, and in the fourth quarter alone Notre Dame guard Marina Mabrey scored 12 of her 21 points on the night off of 75 percent 3-point shooting. And even behind a trademark Ogunbowale last-second 3-pointer at the end of the third, the Irish were bested at the end. It wasn’t until two minutes into the final quarter that Notre Dame was even within a single-possession game of their opponents – their first since the opening minutes of play. At one point the Lady Bears were up by 17 after ending the first period with a 25-14 lead. 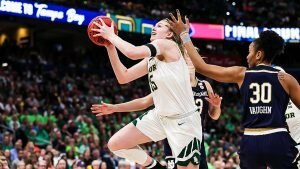 When Baylor forward Lauren Cox went down with a left knee injury with less than a minute left in the third, Notre Dame started to gain momentum on offense. With Cox’s defense out of the game, the Irish went 31-20 in the remaining 11 minutes. Lauren Cox was dominating the defensive end of the floor before going down in the second half with a knee injury. Photo courtesy of Baylor Athletics. 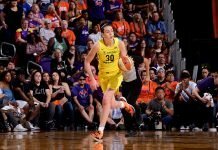 Cox was taken off the court in a wheelchair, but returned to the bench in a brace to cheer on her teammates, limping on crutches to the huddle during timeouts. In the first quarter Baylor held Ogunbowale to just five points, her lowest-scoring quarter. As a team, Notre Dame shot 20 percent from the field, just 5-of-24. In the first five minutes they shot just seven percent, making only one shot – a second-chance layup. Meanwhile, the Lady Bears went on an early 11-0 run to lead 13-3, dominating in transition, scoring 12 points off of fast breaks, and in the paint with 18 points down low. Irish shots just refused to fall, and the early-game hole they dug themselves into ultimately proved to be too big to surmount. Jackson netted a thrilling buzzer-beating, fast-break layup off a steal at the end of the first quarter. That bucket plus her game-winning layup earned her a tournament Most Outstanding Player recognition. Jackie Young, Brianna Turner, Jessica Snepard and Marina Mabrey help Arike Ogunbowale up after a foul. Photo courtesy of Notre Dame Athletics. On defense however, Jackson was in foul trouble, earning her fourth foul with more than nine minutes left to play. With Cox out, it was crucial that the Lady Bears – and Jackson particularly – remain poised. But just 30 seconds later guard Didi Richards earned her fourth foul. And in the fourth quarter alone, Smith earned four fouls before fouling out with less than a minute of play. The Irish had hoped to defend their 2018 National Championship, in which Ogunbowale lifted them with a buzzer-beating shot. 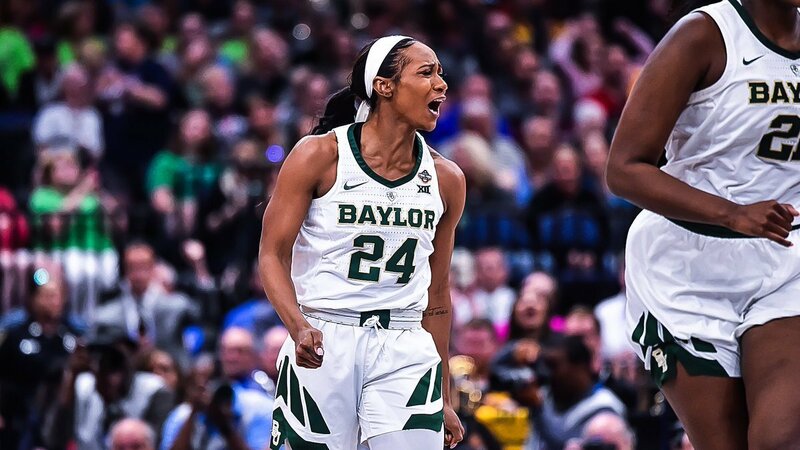 As the post-game celebration commenced, Cox’s teammates thrust the trophy into her hands and she held it up to the crowd of Baylor fans, tears streaming down her face. Previous articleAre you ready for this National Championship?